Ellis Park is a sports stadium in Johannesburg, South Africa. It is also known as Coca-Cola Park. Ellis Park was first built in 1928 as a Rugby union stadium. It was demolished and rebuilt in 1982, still as a rugby staduim. It was named after JD Ellis, a Johannesburg city councilor. JD Ellis allowed the use of the land for a stadium. He allowed 13 acres to build the stadium. In the first stadium 100 000 visitors saw the Rugbymatch South Africa versus England (1955). The stadium was used for different events. 1995 it was part of the Rugby-Union-Worldchampionship 1995 and 2009 it hosted the CONFED-Cup and 2010 the FIFA World Cup. In 2009, the stadium was improved. More seats were added. Stadium access was made eaiser for disabled fans. A new pitch and media room was added. The sound system (loudspeaker)was improved. The stadium hosted the 2010 FIFA World Cup. It was one of the 10 stadiums where World Cup games were played. All times are given in South African Standard time (UTC+2). The stadium is used by the soccerteams Gauteng Lions and Orlando Pirats. The stadium is also the homeground of two rugbyteams (Lions and Golden Lions). 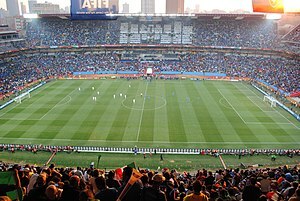 Wikimedia Commons has media related to Ellis Park Stadium. This page was last changed on 9 June 2018, at 21:55.